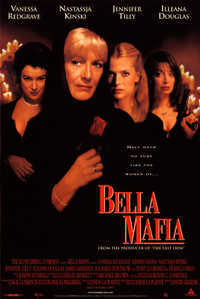 Bella Mafia is a 1997 American television film starring Vanessa Redgrave and Dennis Farina. Redgrave was nominated for the Golden Globe Award for Best Actress - Miniseries or Television Film. The movie has gained a cult following. It is based on the book Bella Mafia written in 1991 by English author Lynda La Plante. This webpage uses material from the Wikipedia article "Bella_Mafia" and is licensed under the GNU Free Documentation License. Reality TV World is not responsible for any errors or omissions the Wikipedia article may contain.